We can always expect each new iPhone to come with improved hardware and at least one new feature, such as Siri or Touch ID. Unfortunately, Apple hasn’t added more memory to the device since the 64GB iPhone 4s arrived in 2011. To address this, Mophie recently introduced its first battery case that also features built-in storage. Is the new Mophie Space Pack any good? It’s time to find out. What Is It? The Mophie Space Pack looks nearly identical to Mophie’s other iPhone battery cases, measuring just 2.57 inches by 5.66 inches by 0.63 inches. It weighs 2.8 oz., is only 3 mm longer than Mophie’s standard Juice Pack Air, and features a 1,700 mAH battery. The case is made of hard plastic and rubber. The 32GB model promises available storage for more than 16,000 photos, 14 hours of videos, and 9,000 songs. The battery adds eight hours of talk time, 10 hours of video playback, and 40 hours of music playback. Integration With The Device The iPhone slides in and out of the 2-piece Mophie Space Pack. 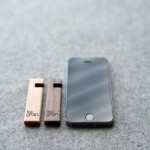 The fit is snug, but not enough that it makes removing the iPhone difficult. The case covers buttons and other controls on the device, but does not cover the iPhone's display screen. Touch ID The Mophie Space Pack does not come into contact with the home button on the iPhone. Therefore, the Touch ID feature on the iPhone 5s is not affected. The Buttons I’ve never been thrilled with using cases that cover volume control buttons. Most times, the snug fit makes using the buttons with success next to impossible. On the Mophie Space Pack, the controls are easily accessible, although they do seem to stick for a while. A short break-in period eliminates this problem after a few tries. The mute button also works as intended, although it too may stick at first. The Jacks The Mophie Space Pack covers the iPhone’s headphone jack, thereby requiring the included pass-through headphone adapter. To charge the case, you must use the included micro USB cable, as the Mophie Space Pack is not compatible with Apple's Lightning cable. Proximity Sensor No worries here. The sensor works just fine. Camera And Flash The Mophie Space Pack doesn’t cover the camera on either side of the iPhone, or its flash. Accessories The Mophie Space Pack ships with the previously mentioned micro USB cable, and pass-through headphone adapter. Mophie says the case has a “compact design,” and is “light-weight.” Both of these points are correct, and you’ll never confuse a Mophie Space Pack for an Otterbox Defender. Nonetheless, the added bulk is there and will be noticeable, depending on the type of case you are used to carrying. That being said, the Mophie Space Pack doesn’t feel any bulkier than other Mophie battery packs. Nor is its added length (as compared to the Juice Pack Air) noticeable. Call quality I didn’t experience any call difficulty using the Mophie Space Pack. 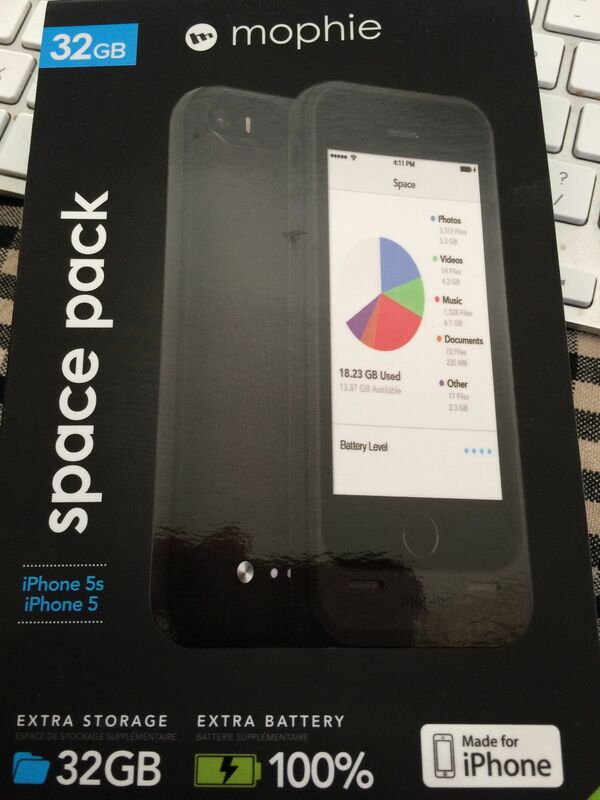 The Space app Up until now, this review focused on the Mophie Space Pack hardware. Now, we’ll turn our attention to what truly makes the case unique — the additional storage it provides. In order to access this storage, you must download and install the free Space app on the App Store. From within this app, you’re able to access, manage, and organize photos, videos, music, documents, and other files. 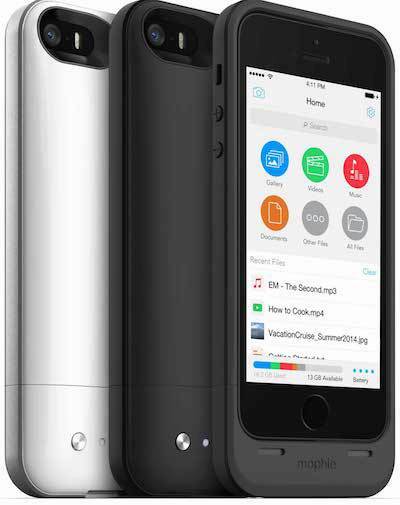 The Good The Mophie Space Pack does a great job of storing photos. All you have to do is switch the “Sync Camera Roll” toggle to the "on" position within the app to copy photos from the device. You can then delete these items from the iPhone to free up space. Photos, like all the files in the Space app, are arranged by date. 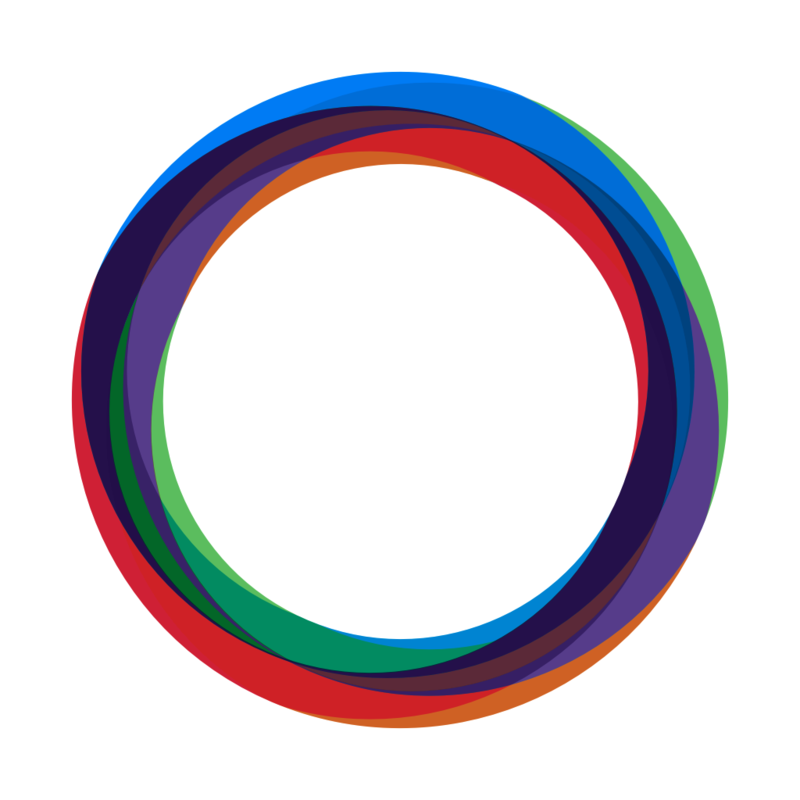 The sharing tools available within iOS for photos (Messages, Twitter, etc.) is also available here. You can also add photos to a favorites list. 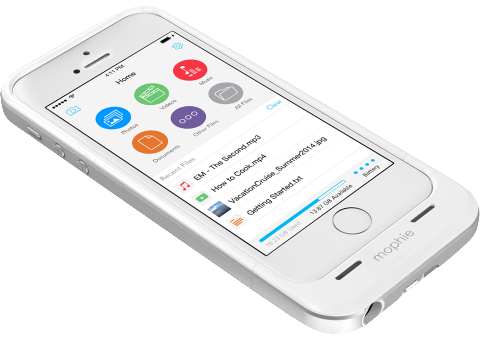 Files attached to email are simple to add to the Mophie Space Pack. Simply hold your finger on the file in the Mail app until the iOS share screen appears. Select “Open in Space,” and the file is automatically saved to the case, and listed under Documents. The Not So Good Mophie Space Pack functionality becomes less user friendly once you get past photos and attachments. To save music and videos to the case, and files not on the iPhone, you must use the micro USB cable and attach it to a PC or Mac. From there, you can drag and drop files right into the Mophie Space Pack, like you would do with any external drive. The Space app will organize the files automatically once complete. Music downloaded from iTunes (from a computer) is easily accessible through the Space app using a tool that looks very similar to Apple's iOS Music app. Unfortunately, the same cannot be said about videos purchased through iTunes. Technically, you can save iTunes videos files to the Mophie Space Pack -- you just can’t play them from inside the app. I found this restriction somewhat unfortunate, and given the price of the Mophie Space Pack, a possible deal breaker for many. The Mophie Space Pack feels tough enough to last a long time. More than likely, the hardware will hold up much longer than the software it requires to charge the battery and store files. The Mophie Space Pack is the only product of its kind currently available on the market — which could be a double-edged sword. The Mophie Space Pack is $149.95 for the 16GB model, and $179.95 for the 32GB model. 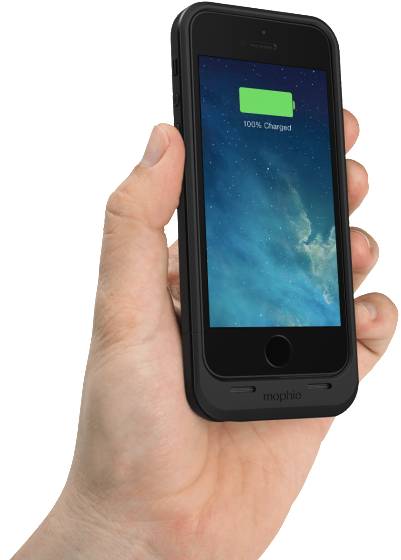 It is available to order through the Mophie website and should launch at retailers soon. Even with some important restrictions, the Mophie Space Pack is a great product that serves two roles with ease. The price is on the high side, however, and must be considered. 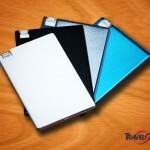 Buy now: The Mophie Space Pack is available to purchase at mophie.com. Note: When originally published, this review said that Mophie only offers a 90-day warranty on products. This was incorrect, and we regret the error. In fact, the company offers a 1-year limited warranty on all products and a 90-day limited warranty on refurbished products purchased through third party sellers. For more information on Mophie's warranty policies, click here.